Greetings, all, from the very hot Biyamiti Bushveld Camp in the Kruger National Park. As I type this I'm watching 20 elephants and four buffalo jostling for position in the remaining pools in the Biyamiti River, just on the other side of the camp fence. 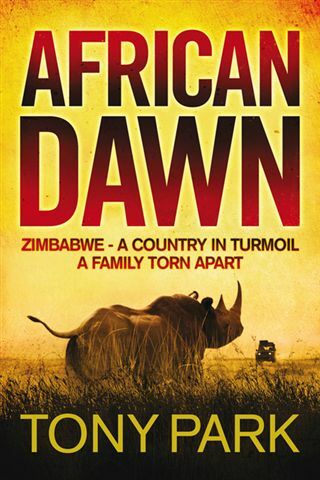 Tony Park has set himself the mammoth task of re-creating a quite different world, also going from bad times to worse, in African Dawn, a sprawling family history of Rhodesia-Zimbabwe from the 1950s to the present day. We start with the 1959 protests about bus fares that highlighted the plight of unempowered native Africans in their own country, and continue through to the brutal expulsions of white farmers from what they, in turn, considered their ancestral lands in recent years. 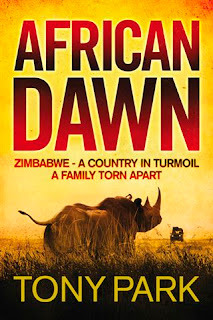 There are a few stereotypes in the wronged black child who goes on to become a corrupt evil warlord and big-game poacher, the womanising gun-slinging colonial who goes off the rails, his hard-done-by introverted brother and two generations of up-for-it plucky gals. But there is probably some truth in all of them. The anthropomorphising of a loner black rhino calf jars at first but he goes on to become an important leitmotif running through a half century of blood-soaked history. Park’s obvious role model is that great master of the colonial epic, Wilbur Smith, whose fans will not be disappointed to have found their spiritual heir. Some big words in there, but not bad, eh? (I'd probably prefer to be Wilbur's actual monetary heir, rather than spiritual heir, but I'll take whatever I can get). Very good, TP. Does this mean you are now legit? A bit bitchy in parts but noice to get reviewed in the Times. That sent me diving for my dictionary to work out what the heck a leitmotif was.